The book briefly touches on the origins of Potted and we learn that tile-inset-pavers, and perfecting the technique of creating them, were the impetus behind Mary and Annette opening the store. I took a photo of a few of those pavers in the hellstrip in front of the shop when I first visited back in 2012...who knew? I just thought they were fabulous. I think we're all familiar with the cinder block planter wall originated by the ladies of Potted (see an Anthropologie version here), but for the book they've jazzed it up with painted nooks accented with candles. Are you thinking you need to own this book? Well you're right, of course. If you're in the L.A. area I'm sure you can pick it up at Potted. It you're not you can purchase it from the Timber Press website (note: Hardy Plant Society of Oregon and Pacific Horticulture members get 35% off the list price of Timber Press books!) or from Amazon. AND...Timber Press has generously supplied me with a copy to give-away! Just comment below to be entered to win. Of course I'd love to hear about any containers you've DIY'd, or hope to learn to DIY, but any comment will get you entered to win — as long as (and this is IMPORTANT) you include a way for me to get in touch with you (a link to an active blog or an email address) and you're in the contiguous USA. All comments left before midnight July 26th will be eligible. The winner will be announced on Thursday the 27th. Good luck! Photos of POTTED book projects used by permission from Timber Press. Timber Press supplied me with a complimentary review copy of the book, all opinions are my own. All other material © 2009-2017 by Loree Bohl for danger garden. Unauthorized reproduction prohibited and just plain rude. I didn't realize those pavers were in front of Potted. I remember seeing them on your blog and tried to do my own version with some glass tiles from Bedrock Industries in Seattle. I'd love to win this book. So when you say "tried"...did it not turn out so well? There: You've convinced me I need this book. I love to work with pots, and I think this will be a joy as long as I live (I might eventually get too old for large-scale gardening, but not for potted gardens). I'm still learning, but some of the creative pots I've worked on include whisky barrels and succulents and plant stands to raise ceramic pots above the ground cover. Love those pavers! I also like the way they include samples from different garden styles. Never too old to garden, but yes...the way we do it might have to adjust over time. I love your dish planters! It would be great to get some good ideas from this book to add to my new space...I'm all about that DIY! Loved your presentation at the Garden Bloggers Fling! I was just brainstorming planter ideas for a specific spot at the front of my house. My favorite medium is concrete which limits ideas to small projects. This book would be the inspiration I need. I love concrete but hate working with it. I admire those that do! This book looks amazing! So much creativity. Good paint job on the PVC tubes: matte and then a glossy pattern added. Great look. Just the pictures you've shown have sparked some ideas. Mary and Annette do so many cool and creative things! Happy Birthday Danger. This book looks fantastic! I recently bought a old collander at Goodwill and re-purposed it into a Hen and Chicks pot. Great Drainage! Oh yes, colanders make great repurposed planters! Sorry DD, ya...shipping to the UK isn't part of the deal...but I'm sure you can find the book there. Those pvc planters are gorgeous! How do they plant them? Are plants in containers plopped in the top or do they actually put soil in them? How do you control the water/soil runoff on a porch? So many questions but I still want to do it. The book doesn't actually go into details about planting, but they do show a drain piece that pops into the bottom of PVC pipes, ready-made! The holes are a bit large - but you could put a piece of screen over it. The book walks you through step by step! That's one of the things I love about your garden, Loree. You use just the right containers to show off your fabulous plants. I'd love to win this book, because I'm not all that creative myself, but like you said, given examples, I can adjust them for use in my own garden. You know where to find me! I love DIY books that are really useful! And that's an important distinction, this one really is! Looks like a great book, and the honour you desere that your UFO planters feature! Loved that store and would love to try their Potted ideas! Glad you've had a chance to visit. I like that attitude Diane! In lieu of a visit to Potted or your garden for inspiration, this book would be a huge help. You know how to find me. I do. And you've been to my garden! Thanks for alerting me to the book. I can't enter your giveaway as I'm in Australia, but I just ordered myself a copy from an online seller in the UK. Yay! Glad to hear it. I am confident you'll find lots of inspiration. Thanks for the opportunity to win this fantastic book! This book sounds wonderful, and I'd love to win it! I've repurposed plant containers from concrete drainage pipes, terra cotta chimney flue liners, and such, but never made them. I do want to make my own hypertufa containers someday, and who knows what else?!? Heaven knows I love a good project and the inspiration to get it started. Love those ideas-especially the block wall. count me in on the giveaway. Really, this book looks like a treat! That looks like an incredible book. I would love to win it. Oh, and I love your garden posts on IG. This is irubymoon@gmail.com and I have mainly picked up free metal pieces and put sedum gardens in them. I love the idea of painted PVC which I have (oh, I also have sewer pipe...new eyes need to go looking) I am hoping they have ideas for all these large black plastic pots I have. Love your ideas! Would love to see more! Kudos. 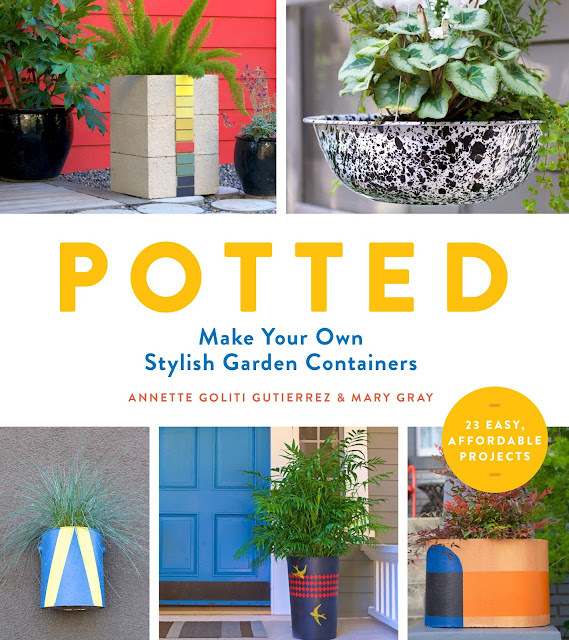 Potted has been a great local resource for years. I'm glad they are getting their ideas and ethnic out into the world. My husband would definitely like that book! Great review! I managed to escape the Instagram labyrinth long enough to post a comment yesterday, and my phone swallowed it, darn. Anyhow, these days I'm putting rusty plow discs under wide clay pots, atop terra cotta cylinders. Yay for industrial salvage :-))) I'd love this book!